I felt deeply ashamed to be English during the visit of the President of the United States to our country. Regardless of who fills the office, we owe it to the office of that great country to pay respect and the sight of the howling mob in Woodstock, London and in Scotland as well as scattered across other parts of the United Kingdom was, in my view, an utter disgrace. To hear all of the tripe directed at Donald Trump made me quite nauseous and I was disappointed that the BBC chose to make so much of it. Media reporting only adds to the hype and probably encourages more of the scruffy left-wingers to ease themselves out of their comfortable chairs, put down their benefit giros, grab their protest banners and take to the streets. However, the BBC’s coverage was as nothing when compared with the TV equivalent of the Morning Star. I mean, of course, Channel Four news. I had quietly hoped that the US secret service would have a marksman in Westminster with a small calibre rifle to take a pot-shot at the nasty balloon. It deserved to be deflated in public as a nasty and tasteless form of protest. However, I suspect a sense of decorum and concern for public safety prevailed! If I had any consolation it was tinged with regret that the President’s visit had not been timed for the hunting season when it would have given the hunt antis a difficult decision as to whether to protest at lawful hunt activity or the visit of the President of the USA! A minority of mainly left-leaning agitators has brought disgrace on our country but it is inevitable in a country that promotes freedom of speech under the law. Just think what would have happened to the protestors if they lived in China or Russia and chose to take to the streets in opposition to government policy there! 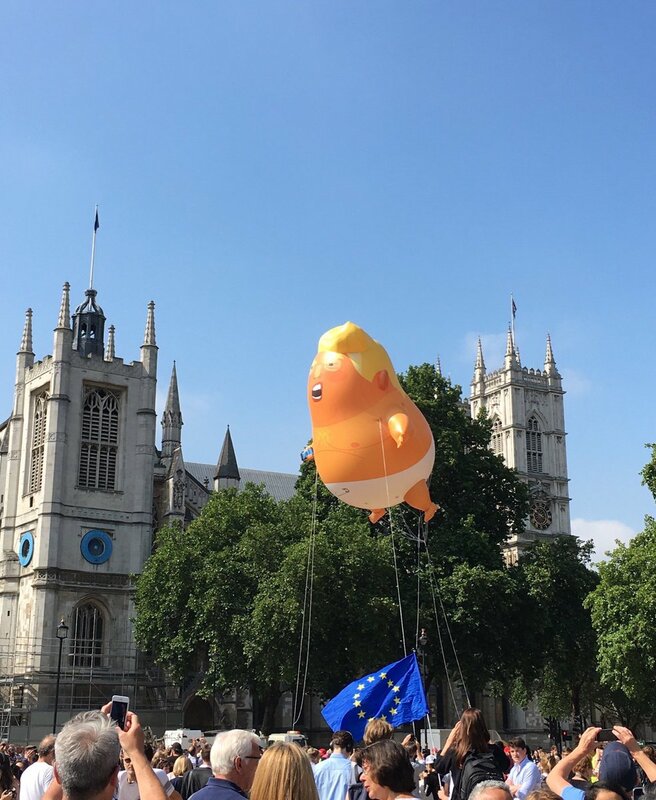 This entry was posted in Politics and tagged POTUS, Trump balloon. Bookmark the permalink.